The lesson also discusses how to identify when these parameterisations are not performing well and steps to address the issues that arise. A very useful lesson for the understanding of microphysics and CP schemes in numerical modelling parameterisation. Quiz is also effective in assimilation and application of the contents of lesson. Great case study to help understand the principles. State the primary purpose of microphysical and convective parameterisation schemes in NWP models and the forecast variables directly impacted by them. Describe the differences between simple and complex cloud microphysics schemes. Adjust sensible weather forecast variables such as 2-m temperature when an NWP forecast contains cloud errors resulting from misforecast mesoscale convective features. Adjust forecasts to take into account the impacts of over- and underactive convective schemes on NWP forecasts. Identify the advantages of complex microphysics schemes in depicting precipitation features. 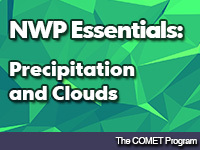 Identify the elements in NWP models that have the most significant impact on precipitation forecasts in large-scale models.